Halong Bay is a legendary world just waiting to be explored. 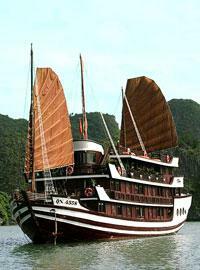 See Halong Bay in style on board Bhaya - a newly built wooden junk featuring twenty luxurious cabins furnished in classic Eastern style. A truly memorable experience awaits you as you cruise this delightful Bay, reveling in its tranquility as you escape the bustling tourist sights. Start your day with calming Tai Chi, dine on fresh seafood on the deck, then retire to your own plush cabin - just some of the highlights of Bhaya’s exceptional Halong Bay cruise. 11.00 Disembark at Bhaya Café, Halong City where our waiting vehicle will transfer us back to hotel in Hanoi. End of services.